Gelatine powder for arthritis contains the building blocks for joints. Gelatine powder for arthritis contains the building blocks for joint cartilage. This cartilage food can be made easily in the home from chicken bones and used to rebuild your aging joints. Gelatin, by the way, is how it's spelt in America. 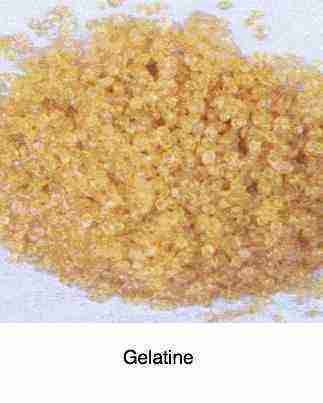 What is gelatine? 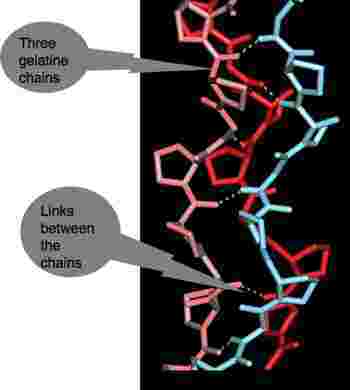 See these three chains made of amino acids, pink, red and blue, linked together? Gelatin is the gel derived from the protein collagen found inside animal bones and cartilage. It is a protein, though it's not a complete. It lacks certain essential amino acids like tryptophan and methionine, so you can’t survive on gelatine as your only protein source. However it is the main protein used by your body to make the cartilage that covers the bones in your joints. Hence gelatine powder for arthritis. It's a prime subject for discussion at chiropractic help; unhealthy cartilage equals pain. 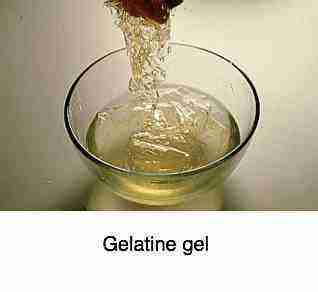 Gelatine is a hydrolyzed form of collagen. What does that mean? Individual fibres in the body are bound together by chemical bonds to make up cartilage and other tissues, like skin, in the body. In the preparation of gelatine it is these crosslinks that must be first be broken down by hydrolysis. It can be easily done in the home, forming a semi solid colloid gel; gelatine. Suffering from joint pain? Gelatine powder for arthritis may be part of the solution. And of course, whether in powder form, sheets, or your own homemade chicken bones bouillon. Gelatine powder for arthritis can be made easily in the home and used to rebuild aging cartilage. 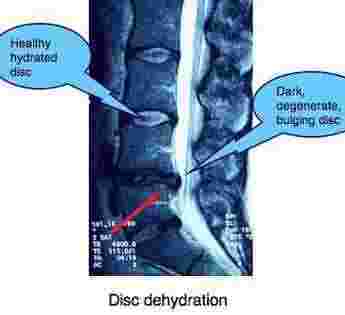 You can also see how the water may seep into the bone,called a Modic effect, or modic change, which is the sign of deep bone pain. 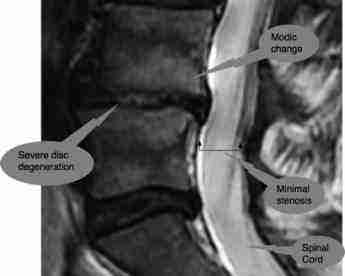 This cannot be seen by your chiropractor, unless he has a scan; it's not visible on ordinary plain xrays; and may explain why your back is still aching long after the joint subluxations have been corrected. As the normal movement in the joint is restored, gradually this water that has seeped into the bone finds it's way back into normal circulation. Gelatine powder has also been claimed to promote general joint health. One study for example found that gelatin relieved knee pain and stiffness in athletes. What is not well understood is why gelatine powder, the foundation of cartilage, should relieve arthritic pain. Once in the stomach, gelatine powder is broken down into its constituent amino acids, and then reformulated into the protein of hyaline cartilage in the bones. Never mind, just accept that it works. Healthy cartilage also requires a low omega 6 to 3 ratio. That means less seed oils which is what is used in most salad dressings, more olive oil, plenty of fish and freshly ground flax seed. Several researchers found that gelatin reinforces the stomach mucous lining. It has been found to reduce the damage to the stomach wall by alcohol and stress, halving the size of ulcers. 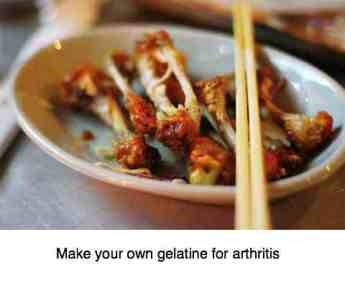 Dem chicken bones make the perfect gelatine powder for arthritis; but you don't need to dehydrate it. Do use organically reared birds for your chicken bones bouillon; it makes a wonderful nutritious starter for any soup . It's all about first stepping up to life on a healthier plane; living differently. Going without personal medical insurance is a major step in life and certainly not for all. Follow the rules of good health, and there's a 90% chance you'll score big. Save those premiums diligently and within ten years you'll be a millionaire. But can you handle the fact that it can all go wrong? We are now 7 years into living without personal medical insurance and we have a very nice little kitty stored up for that rainy day that will surely strike even the most ardent fans of healthy living. Don't put it away and you'll be facing serious misery when you need medical or chiropractic care. Can you simply regularly eat a chicken bones bouillon and expect to safely drop your insurance? Obviously not. Good health is about a number of important habits. Each one you add, the greater the chance of improving your health. Here's my little list of good habits. I'm sure you can add to it. Take regular exercise. Any kind that appeals to you. As far as you possibly can, regularly eat natural, home made food. Don' t get neurotic, we're all nuts after all; have a coke now and again, eat out at fast food now once in a while, but day by day? The food your grandmother would have provided for her family. Not your mother's. Freshly squeezed fruit juice of which OJ is probably the easiest. Squeeze it yourself, top up with water and drink it; don't strain out the pulp. At least five coloured foods per day; I aim for ten. Salads, vegetables, and fruit must be on the daily menu. At least once a week have a vegetable protein dinner, like tofu, green beans, chickpeas, lentils, hummus etc. Eat only brown rice. I mean, absolutely avoid white; it's equivalent to having only bread made from cake flour. Avoid sugary and white flour products. Bagels, ugh. Eat fatty fish regularly for your heart and brains. Or other sources of omega-3, like freshly ground flax seed and walnuts. For your cartilage, omega-3, keep your weight in trim, and gelatine powder for arthritis. Generalised muscle weakness ...how white rice causes a thiamine deficiency.